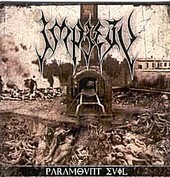 Death metal outfit Impiety knows their way around the genre, as this quartet bend notes, gallops guitars and unleashes growls with the acumen of seasoned pros. On PARAMOUNT EVIL, the latest eight-track offering from this Southeast Asian band, tracks like "Reign the Vulture" intertwine the classic sounds of Bathory with the sonic insanity of Morbid Angel, yielding a beastly entity capable of ripping heads off bodies and stirring up total devastation. Not a whole lot of originality from these guys is exhibited, but when cranked to 11, songs such as the march-like death stomp into moshpit maddening pace of "Indomitable Fist of Decius" is a surefire method to piss off everyone around you.